Enter Blue, a new low-cost, human-friendly robot conceived and built by a team of researchers at the University of California, Berkeley. Blue was designed to use recent advances in artificial intelligence (AI) and deep reinforcement learning to master intricate human tasks, all while remaining affordable and safe enough that every artificial intelligence researcher—and eventually every home—could have one. "AI has done a lot for existing robots, but we wanted to design a robot that is right for AI," Abbeel said. "Existing robots are too expensive, not safe around humans and similarly not safe around themselves—if they learn through trial and error, they will easily break themselves. We wanted to create a new robot that is right for the AI age rather than for the high-precision, sub-millimeter, factory automation age." Blue's durable, plastic parts and high-performance motors total less than $5,000 to manufacture and assemble. Its arms, each about the size of the average bodybuilder's, are sensitive to outside forces—like a hand pushing it away—and has rounded edges and minimal pinch points to avoid catching stray fingers. Blue's arms can be very stiff, like a human flexing, or very flexible, like a human relaxing, or anything in between. Robotics has traditionally focused on industrial applications, where robots need strength and precision to carry out repetitive tasks perfectly every time. These robots flourish in highly structured, predictable environments—a far cry from the traditional American home, where you might find children, pets and dirty laundry on the floor. If an AI is going to make mistakes and learn by doing in unstructured environments, these rigid robots just won't work. To make experimentation safer, Blue was designed to be force-controlled—highly sensitive to outside forces, always modulating the amount of force it exerts at any given time. 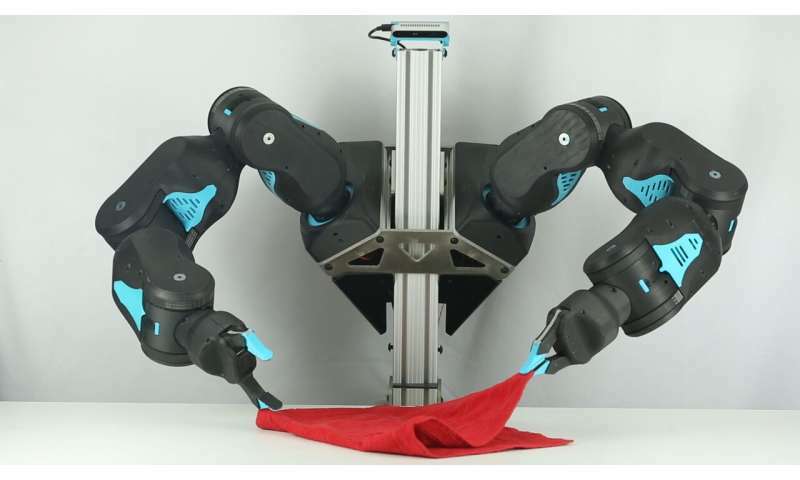 "One of the things that's really cool about the design of this robot is that we can make it force-sensitive, nice and reactive, or we can choose to have it be very strong and very rigid," Gealy said. "Researchers can adjust how stiff the robot is, and what kind of stiffness—do you want it to feel like molasses? Do you want it to feel like a spring? A combination of those? If we want robots to move toward the home and perform in these increasingly unstructured environments, they are going to need that capability." To achieve these capabilities at low cost, the team considered what features Blue needed to complete human-centered tasks, and what it could go without. For example, the researchers gave Blue a wide range of motion—it has joints that can move in the same directions as a human shoulder, elbow and wrist—to enable humans to more easily teach it how to complete tricky maneuvers using virtual reality. But the agile robot arms lack some of the strength and precision of a typical robot.